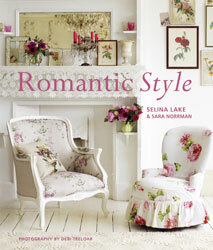 Maison Decor: My Feather Tree Arrives and the Romantic Style Book winner! My Feather Tree Arrives and the Romantic Style Book winner! I opened it up last night. I bought it on Ebay for $15.00. printed on the upper corner. It appears to be in great condition. It came in the original packaging. in place in the container was crumbling out. Martha's tree comes with ornaments too. They were all there underneath a dusty plastic cover. The tree comes with spun snow cover for the base. I couldn't wait to play with it! But as a blogger I had to take a picture first. it was lit up by a beam of sunshine. Look how the sunshine bathes this tree. It was kind of enchanting. I had set aside my smallest ornaments for this tree. Old bells and ornaments with tinsel inside. The small round green and gold came with the tree. these blue glitter snowflakes from Walmart. I LOVE this darling tree! This is sitting on my coffee table/bench in the middle of my room. where the "big" tree is sitting now. Like Sylvester Stallone in high heel boots! Feather Trees are a German Tradition. I think they were a great addition to the holidays. This will be one well loved little tree. Ryland Peters and Small Publishing Co. I love the entire room! ~swoon~ The feather tree is stunning and so romantic. I love how the morning sun spotlights it. So beautiful! Love, love, love your feather tree. I have been looking for one for a long time but have been looking for an antique one. I think I need to change my thinking on that??? Your feather tree is charming and I am so very envious. Love the feather tree and the entire room! Just so pretty with the sun streaming through the windows! Sit back and enjoy! Love your little feather tree, Amy, it's precious. So glad it's got a pretty home now! Congrats to Amy, the book looks lovely. Oh Amy, your trees are beautiful! Your living room looks amazing all dressed up! Your feather tree is gorgeous. Your entire living room is gorgeous too!!! Adorable! Perfectly suits your style! And it even came with ornaments! What a great find! What a gorgeous little tree. I love the decorations,especially those blue glitter snowflakes. Your room is divine! What a perfect little breath of fresh air. Adorable! Oooh, I like your feather tree very much! Your living room is so beautiful and I've enjoyed viewing it. Heather's on the sofa watching TV. I'm about to head to the basement for some decorations to work on our tree. It's been a crazy time, but I'm not complaining. Oh...your tree is beautiful. I love how you have decorated it. I am still torn on what to do with mine but now I am thinking that just some of my favorite ornaments will be fine! I like the white, too! Martha's ornaments are very pretty! Congrats to Amy on her win! The book is on my wish list!! I love both your trees! Very lovely. I'm one of your newest followers and am SO happy to be here - looking forward to reading each and every one of your past posts. LOVE your taste and style! It's magical! Lucky girl to get it at that price. Love it. tree : ) So very sweet! Thanks so much for visiting my new blog via White Wednesday. I just LOVE your blog, and it's nice to meet a local gal. Your home is simply stunning. I love the feather tree and angel wings, too. I saw the same article in Country Living and was wondering about those wings...you have great style! Sooooo SHaBBy ~ In a good way that is!*!*! Your room is lovely ~ glad I hopped on over! I want your feather tree ... this is a stick up! Love that tree!!! Those ornaments are precious and the sunlight shining on it makes it look so illuminated. I love BOTH of your trees! So beautiful! I love your little feather tree and the way it is sitting in the sun in that spot. Your bigger tree is lovely too. Your little feather tree is so sweet and shining through the sunlight. I just love it! Your entire room looks festive and lovely. That is sooo pretty. I actually put some of the trees from e-Bay on watch. So cute!!! It is just perfect - I'm keeping my eyes open for one! Oh, wow, Amy, I just loooove your feather tree. It's so pretty! And that book looks wonderful. I'll have to look for that one. Hi Amy, Wow I am excited for you... your little tree is a beauty, the light flooding it... pure magic!! I have been drooling over your fireplace, overmantle and sconces, just stunning!! Love your little feather tree Amy! How cute! Looks great on the table and with the other tree in the corner. As usual, all is soooo pretty! I love your little feather tree and especially the way you caught the light beaming down. Don't you just love it when you get so excited about a purchase? Makes it all worthwhile. I had a chance to browse through a couple of your past posts as well... your home is looking very festive for the holidays, Amy! Your trees are beautiful, and I love the angel wings you have hanging on the french door! Love your new feather tree Amy! And it's a bargain too...love that also included the ornaments. I still have to complete my Christmas decor...it's been so hectic here since I've just started a new business venture...I'm going madly insane. I love the new tree! May I invite myself over to nap on the couch? Oh...I love the feather tree. I was looking on ebay the other night for a white one just like that and they were all kind of expensive...I got a girp and told myself I didn't need one after all. I'm using the topper of an old white tree that I had...I always do that keep the tops of trees to use as small trees. I love the big tree too. I went to Grandinroad the other night to see what Martha Stewart stuff they had...and I think it was there that i saw the cool silver tree that I showed last week on my blog that was Martha's. I was like....Oh....I want!!!! Oh, sorry you couldn't go fabric shopping with me this week - I kind of ran in and ran out anyway though but the drive was spectacular along the ocean while the sun was shining so bright and the waves were crashing on the sea-wall... made the whole trip worth it just for that! Love your living room all decorated. I don't even have a tree yet - wayyyyyyyyyy behind this year. But my workroom is clean and it's time to get to work! Maybe the tree this weekend! I am so glad that I found your blog as well! And what a deal on the little feather tree! I'll be searching ebay daily from now until mid-January. What a find!